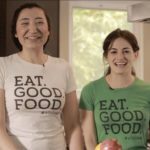 Chefs Rose Kai and Sami Udell are the talented, veggie lovers behind WholeSam, a food truck they launched to bring local, “everything-from-scratch” salads, bowls, and sandwiches to the people of greater LA. Prior to running their own business, Sami worked as a personal chef to Ludacris, while Rose worked as a chef at a vegan restaurant. When their paths crossed in the kitchen, a friendship and mentorship was born, and they soon after joined forces with WholeSam. “Sami is like the yin to my yang. It’s inspiring to know that someone sees the passion I have,” says Rose. “She guides me to help create the things we make in order to be WholeSam.” Not only does Sami see her passion, she shares in it. The two strongly believe that eating healthy is an achievable lifestyle. WholeSam can be found driving across the state of California, feeding and encouraging everyone to make healthy choices. 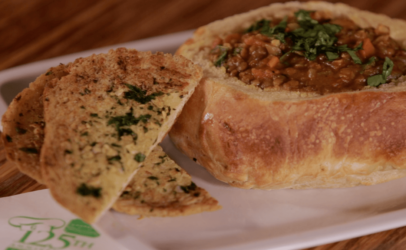 Rich spices, lentils, and veggies create the authentic Moroccan flavor of this dynamic soup, served in our fresh bread bowl. 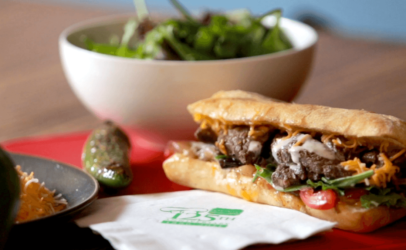 A West Coast take on a Philly classic, seasoned flank steak atop our light and tasty ciabatta roll with a garden variety of fixings. 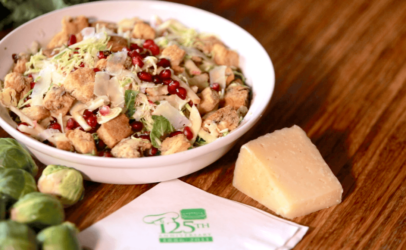 A tossed salad of kale, fresh fruit, manchego cheese, lemon vinaigrette, tahini, and crunchy cranberry orange croutons.